Wool Batting Wrap - Why? Home / Blog / Wool Batting Wrap – Why? Do you ever tuft any of the cushions? I want to tuft one in order the make sure it doest shift over time but am not sure of what I need to do so. Cushions are tufted either for decorative use or for practical use. If your cushion has a lot of wool or loose fibers, say 40% or more of its height, tuft the cushion to keep the fibers in place. If it is mostly latex, tufting is merely for decorative use. 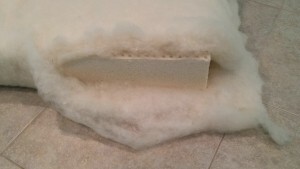 One layer of wool or even two will grip the latex well enough that tufting is not necessary. You will even find that after a few months, wool’s fibers will have twisted into the latex that while you will still be able to peel it off, that batt won’t fall off for anything.